Get The Guide: How to Be Grateful – World Gratitude Day 21st Sept.
How often do you take the time to be grateful? Studies have shown that those who regularly count their blessings have increased levels of overall well-being – something here at Content we’re dedicated to always improving! World Gratitude Day falls this Sunday 21st of September, originating in sunny Hawaii in 1965 as a worldwide way to formally express gratitude. Not sure where to start? We’ve put together a list of three of our favourite ways to begin your own practise…..
One of the easiest ways to get some gratitude into your day is by keeping a ‘gratitude journal’ to record the good times – a great way to ensure a regular practise. What’s the benefit? Two psychologists from the University of Miami conducted a study where participants were instructed to write a few sentences each week, focusing on particular topics. One of the groups was instructed to write about things they were grateful for that had occurred during the week, the second group their daily irritations and the third about positive and negative events that had affected them that week. After 10 weeks, the group instructed to write about gratitude displayed increased optimism and life contentment (of course! ), increased their exercise and had fewer doctors visits as opposed to the control groups who focused on sources of aggravation. Here at Content we advocate regular mindfulness and meditation. Whist mindfulness propagates an approach that tunes you in to the present moment and some forms of meditation advocate focusing on a word or phrase, try combining the two, focusing on what you’re grateful for in the present moment (eg. a delicious meal, a beautiful sight, family). 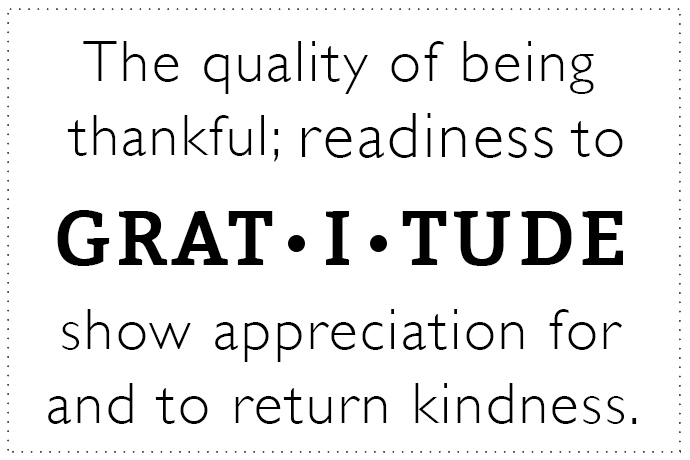 Cultivating gratitude is just like any other practice, it takes a bit of work before it becomes a natural process. Start small, focusing on a few things per week that made you smile. Whilst it may feel unnatural at first, with regular practise you’ll find the process becomes second nature. Support your gratitude practise with our meditation treatment where you will be guided through the tools to begin your own practise.